At a parallel event on the Human Rights Situation in Tibet, UNPO President Ngawang Choephel chaired a panel on Tuesday, 13 March 2012, featuring the participation of Mr. Tseten Samdup Chhoekyapa, representative of H.H. the Dalai Lama for Central and Western Europe, Ms. Kate Saunders, Communications Director with International Campaign for Tibet – United Kingdom, and Mr. Rinchen Sangpo speaking as a witness from Tibet. The event began with a powerful video presentation, including footage from inside Tibet related to the recent wave of self-immolations and subsequent violent crackdown. Speakers highlighted the deteriorating situation in the region, where Chinese authorities have instituted an information blackout and conditions resemble martial law. On Tuesday afternoon, the Council plenary was opened for general debate on human rights situations of concern around the world. Following presentations from states on a wide range of issues, NGOs delivered detailed statements on human rights in China. Speaking on behalf of the Asian Indigenous and Tribal Peoples Network, UNPO President Ngawang Choephel described a continuing pattern of interference in and repression of Tibetan Buddhism by Chinese state authorities. Following this, Jana Brandt of the World Uyghur Congress made a statement on behalf of the Nonviolent Radical Party, Transnational and Transparty (NRPTT). NRPTT’s statement expressed concern over curbs on religious practice in East Turkestan (Xinxiang Uyghur Autonomous Region), which, following dramatic increases over the past year, remain among the harshest in China. 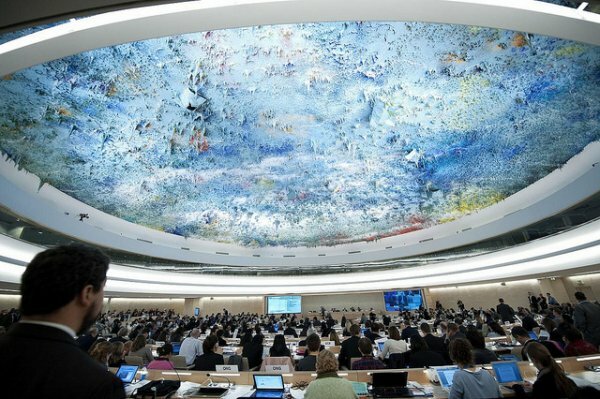 The Nonviolent Radical Party, supported by the World Uyghur Congress (WUC) and UNPO, also submitted a written statement to the 19th Session of the Council calling on the People’s Republic of China and the Human Rights Council to draw attention to and address the issue of radioactive contamination in Lop Nor. The statement, titled “Violation of Uyghurs’ right to health: Nuclear testing in Xinjiang” also requests medical assistance for victims, and for independent research to be conducted in the Lop Nor area to assess the level of risk in the area.